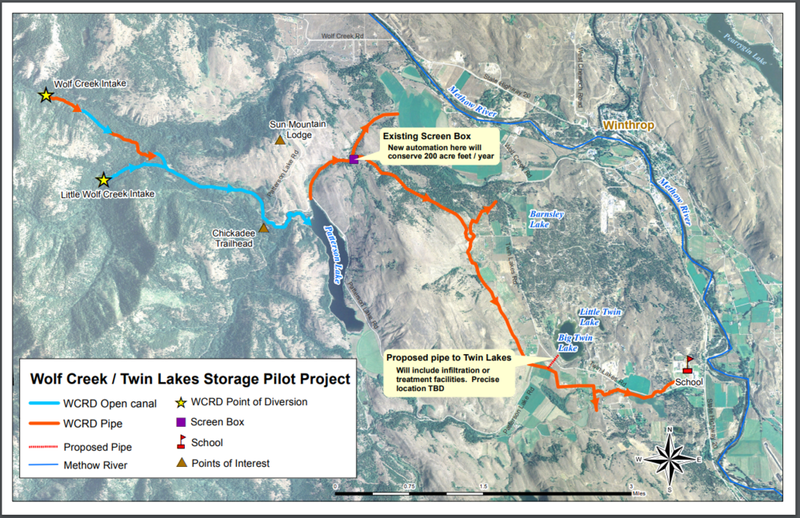 On behalf of the Methow Watershed Council (MWC) and Foundation (MWF) I am writing to let you know about a proposed water project called the Wolf Creek Twin Lakes Storage Pilot Project. This letter is meant to provide you basic information about the project, and let you know of opportunities to learn more. Development of new water storage opportunities to support both instream and out-of-stream uses is a high priority action identified in the MWC’s Detailed Implementation Plan (2009) for the Methow River Watershed. As such, the MWC, along with its funding organization, the Methow Watershed Foundation, have led Department of Ecology funded feasibility investigations of this project since 2015. In addition, the Twin Lakes Aquifer Coalition (TLAC) has been looking into storage options since the early 2000’s. Along with the MWC, Ecology, and TLAC, the other project partner is the Wolf Creek Reclamation District (WCRD). Since the early 2000’s, the water levels of the Twin Lakes near Winthrop have generally been significantly below historical levels. This has effects on water storage, domestic wells, ground water inflow into the main stem Methow River, and water quality, recreation, wild life habitat and associated community values in and around the lakes. WCRD has investigated ways to conserve water in their system and their operations, and has found approximately 200 acre-feet (AF) of water per year that can be saved and used to help the Twin Lakes situation. The water savings will come from installing water level control automation at the screen box (installation is scheduled for early June 2018). This water would be conveyed to the vicinity of Twin Lakes using mostly existing WCRD pipes, with some additional pipe needed at the downstream end. Water put into Twin Lakes during the irrigation season would recharge the aquifer, resulting in year-round flow of groundwater into the mainstem of the Methow River. This is a pilot project, expected to begin operation by the 2019 irrigation season, and will last two to four years, which gives the parties an opportunity to test assumptions about project operations, and make actual observations about conditions resulting from the operations. Results of the pilot will be used to refine lake/aquifer storage volumes and expected instream flow benefits, including quantities available for mitigation of new out-of-stream uses under permanent project development. Monitoring will be conducted during the pilot to help update calibration of a computer model that simulates surface and groundwater behavior. While the pilot project is considered essential for the success of a permanent project, it is not a certainty that a permanent project will result. We have compiled and attached a list of Frequently Asked Questions (FAQs) and project drawings that will give you much more information about this pilot project. The MWC will also be holding a community meeting about this project on Thursday, May 31, 6 p.m. upstairs at the Winthrop Barn, to solicit any questions, concerns, or other input. No RSVP is required. If you have any questions or comments in the meantime, please don’t hesitate to ask. Thanks.